Trust us to provide quality, durable fencing and gates for your home. We pride ourselves on listening to our customers’ wishes and requirements and providing efficient quality solutions. Our customers include individual home owners, letting agencies and property developers and civil engineering projects. We provide feather boarding, tongue and groove, chevron, dog fencing, palisade, acoustic barriers and much more. We are specialists in hanging driveway gates, garden doors and custom built feather boarding fencing with ornamental finishings. We can also provide concrete fencing, chain link, security fencing and security gates and frameworks for installation of solar panels. If you choose from our Jackson Fencing range, the timber (due to its unique curing process) comes with a 25 year product guarantee, which whilst it is more expensive, provides the lowest lifetime cost. 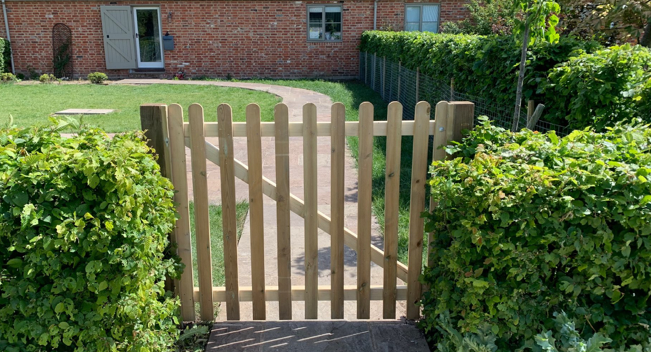 We are all concerned with the environment, so all our fences and gates are produced from a renewable and controlled forestry environment and all waste material is recycled and disposed of in guidance with current regulations. Look through our photo album and see some of the fine work we have done over the years.